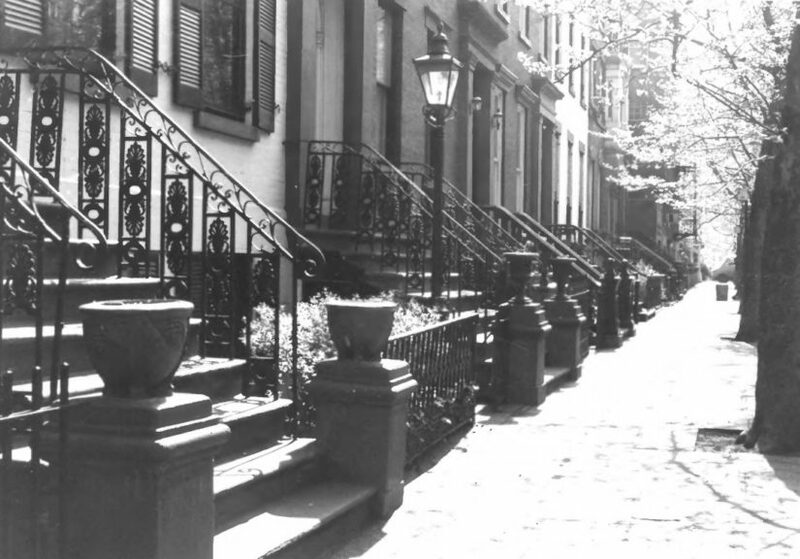 The Community Conservation and Improvement Council stepped up in 1958 to address threats to Brooklyn Heights, and made lasting contributions to preservation efforts in the area. Brooklyn Heights Press for Apr. 28 - May 5, 19, 1939 - Oct. 9, 1942, Aug. 27, 1943 - Jan. 7 1944 on microfilm. Brooklyn Heights Press and Cobble Hill News February 4, 1965 – to present in print. Brooklyn Heights Press, November 17, 1939 - December 31, 1959 on microfilm. Brooklyn Heights Press and Cobble Hill News, February 4, 1965 - to present in print. “Remarks of Otis Pratt Pearsall,” 27 February 1990. “New Group Charts Plan for Housing,” Brooklyn Heights Press, 24 December 1958. Anthony C. Wood, Preserving New York: Winning the Right to Protect A City’s Landmarks (New York: Routledge, 2008), page 210. “CCIC and Association Talk Merger,” Brooklyn Heights Press, 8 January 1959. Pearsall to Lancaster, 7 September 1976, Otis Pratt Pearsall Papers. Brooklyn Heights Press, 26 February 1959. Charles Grutzner, “Brooklynites Set Action on Heights,” The New York Times, 21 April 1959. Anthony C. Wood, Preserving New York: Winning the Right to Protect A City’s Landmarks (New York: Routledge, 2008), page 217. Clay Lancaster, Old Brooklyn Heights: New York’s First Suburb (New York: Dover, 1961). “Arden Rathkopf’s Historic Zoning Proposal of 1959,” Village Views Vol. 7, No. 2 (1995). “Record Crowd Hears CCIC’s Housing Proposal,” Brooklyn Heights Press, 23 April 1959.